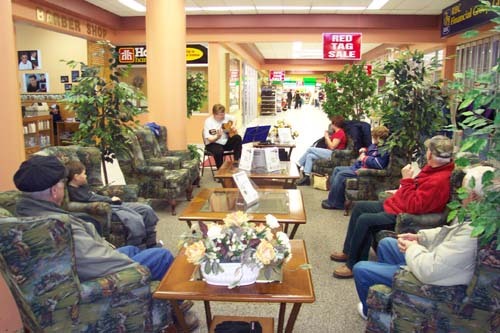 Roger Chevrier is shown in the Centre Court Lounge at the Hanmer Valley Shopping Centre where he launched his monthly Finger Style Guitar Demonstration on March 4, 2006. Roger performed a wide variety of songs on his guitar from 1:00 p.m. until about 3 p.m. He will be in the mall on the first Saturday of every month at the same time and is inviting other guitar enthusiasts to join him for an afternoon of “picking”. 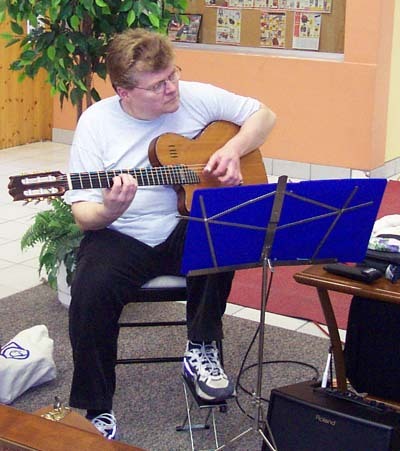 Dozens upon dozens of shoppers stopped by to listen to Roger Chevrier playing his finger-style guitar music on March 4. Chevrier is a life-long resident of Valley East who has a passion for music. He has two radio shows every week on the Laurentian University station, CKLU which can be found by tuning in to 96.7 FM. Every Sunday from 10 a.m. until 12 noon he hosts a show called “Sitting Back Picking”. Tuesdays from 6 to 8 p.m. he hosts a show called “Finger Style Guitar”. Both shows offer listeners some excellent guitar music to relax to. He was also the Musical Director for the Valley Community Theatre, and coordinated the music for the ‘Leader of the Pack’; ‘Grease’; and ‘Suds’. The retired INCO worker is hoping that these monthly sessions at the mall will generate more interest in this kind of music. Roger knows that there are a lot of people who enjoy guitar music, and he is looking forward to some exciting afternoons at the mall.